The volume of human and vehicular traffic has drastically increased at Beitbridge Border Post where travellers are spending between six and nine hours to be cleared for passage into Zimbabwe. Long queues of vehicles, both on the Zimbabwean and South African components of the border have become common, starting from Thursday last week. Sources at the border post attributed the congestion mainly to the unavailability of infrastructure to accommodate the surge in vehicles. Motorists have been the worst affected by the delays, with some saying in separate interviews yesterday that they had spent eight hours to pass through the two countries’ borders. “I spent most of the time in the queue on the South African side of the border, where there is an influx of vehicles travelling to Zimbabwe,” said Mr Prosper Ndlovu. Mr Ndlovu expressed gratitude at speedy clearance on the Zimbabwean component of the border. Through the integrated Border Efficiency and Management Systems (BEAMS), authorities from the two countries have separated traffic into buses, private motorists, commercial, pedestrians, tourists, transit and returning residents. A senior border official said yesterday that they had deployed more manpower to all sections to ensure a speedy flow of traffic. Travellers who had completed immigration formalities on the Zimbabwean border were seen awaiting the arrival of the various vehicles they were travelling in, which were still on the South African border. Long and winding queues of people and vehicles were also noticed at all the customs and immigration clearance points. Zimbabwe Tourism Authority (ZTA) officials were seen giving travellers, including motorists, information on the border clearance procedures. 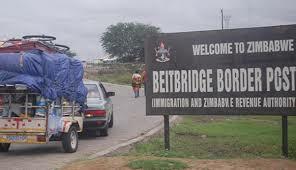 The Assistant Regional Immigration officer in charge of Beitbridge Mr Notius Tarisai could not be reached for comment, although he indicated during a recent interview that they were clearing an average of 25 000 people daily, from December 7.